It is not just beer any more. It has been a long time since I was a fan of beer like Coors Light or Molson Golden. I tend to like beer with more flavour though sometimes something lighter is desired. Recently, I did some research as to what the major breweries mostly in North America put in beer. Pretty scary. Not quite up to ‘German Beer Purity Law’ that allows only certain ingredients. I remember one of the best advertisements I ever saw. 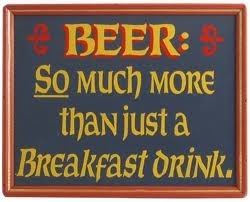 It was a picture outside of an old English pub: “Beer is not only a breakfast drink”. Great marketing. With most craft beer, one can drink it a bit warmer and there will be some taste and flavor that is appealing. Not so with beer from the major breweries – to my experience anyway. Warmed up or at room temperature they taste like crap. Really, though, this is not about taste. It is about health. Alcohol can be damaging all by itself. One should be temperate in drinking. That said, if you are going to drink, make sure it is not full of all kinds of crap that is even more damaging to your body. I know many people that will be extremely careful about the food they eat: no GMOs, etc but then they will drink a cheap beer full of the above ingredients. Over the last number of years most grocery stores carry more and more ‘natural’ foods because of the demand. Personally, I don’t mind paying a little extra knowing my health is at stake. And the same with beer. If I am going to drink, spend for a craft beer or micro brew to support them. Then, hopefully, two things will happen. One, those prices will come down and two, major breweries will have to change their tune and produce something that is a little healthier.